Oklahoma Attorney General Scott Pruitt’s latest boutique lawsuit-one arguing that Colorado’s recent legalization of marijuana violates federal law-conflicts with his legal obsession with states’ rights when it comes to Obamacare. But, really, that’s the least of the problems with the lawsuit, which was filed just before Christmas as a joint effort between Pruitt, pictured right, and Nebraska Attorney General Jon Bruning. Colorado voters legalized marijuana in 2012. Pruitt and Bruning argue that some of the pot cultivated under Colorado’s system is making its way into neighboring states, such as Oklahoma and Nebraska, where pot remains illegal and thus the federal government should enforce its controlled substance laws. The lawsuit, if successful, would shut down the commercial and cultivation aspects of marijuana sales in Colorado, but it could also have major repercussions in the symbiotic relationship between states and the federal government. Of course, shutting down Colorado’s marijuana cultivation and retail facilities would once again give control of the sale of pot, which most people consider less harmful than alcohol, to drug cartels and the black market in that state. States like Colorado and Washington, which have legalized pot, are indirectly challenging the catastrophic and failed “war on drugs” begun by former President Richard Nixon in the 1970s. Law and order conservatives don’t like it. This is part of the pushback. 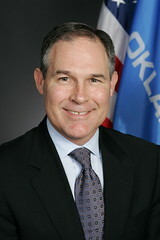 Pruitt’s most public defense of his lawsuit came in a Dec. 26 op-ed article published in the Tulsa World. The article, however, offers no dense statistical and independent evidence that Colorado pot is flooding into Oklahoma or that it presents a major problem even if it is. Pruitt argues, “Some sheriffs in bordering states say they have pulled over drivers and found edibles and marijuana from multiple Colorado retail outlets.” That hardly constitutes enough reason for a taxpayer-funded major lawsuit. How about just asking Colorado to place some signs on highways leading outside into other states that marijuana is not legal in those states? Maybe they’ve already done that. If so, then people buying pot in Colorado and bringing it into a state in which it is illegal are just rolling the dice they won’t get caught. At least it’s not the work of a major drug cartel. Also, Oklahomans have absolutely NOT “rejected the idea of legalizing marijuana,” as Pruitt argues. He points to a recent failed initiative petition drive to legalize medical marijuana here in a process “where it’s relatively easy to get a state question on the ballot.” It’s NOT easy to get a question on the ballot here. Some activists here have long argued the short 90-day time frame allowed for a petition drive and the number of signatures needed-right now it’s at 155,216-are an impediment to democracy. Compare Oklahoma’s ballot petition drive process with other states here. The lawsuit is frivolous and about ideology not about a major law enforcement problem happening in Oklahoma. As I mentioned earlier, it’s also a major contradiction of Pruitt’s continued war against Obamacare through lawsuits, all of which have been philosophically premised on privileging states’ rights over the role of the federal government. Yet, as at least one other writer has pointed out if the lawsuit were to prevail it could open the door to more federal intervention in and control of states’ governance, including “gun control and pollution.” Do lax gun regulation laws in some states lead to violent crimes in their neighboring states? Can two specific states require another state to modify one of its specific laws? Minimum wages were just recently raised in 21 states. Could Pruitt argue these new laws represent a threat to commerce here in Oklahoma because “sheriffs in bordering states” have pulled over people who claim they are moving from Oklahoma to a state with higher wages thus depleting the workforce here? Of course, just asking these tortured rhetorical questions just shows the lawsuit’s lack of merit. Pruitt has become a lighting rod for publicity with his lawsuit war against the Affordable Care Act, and he has also attracted negative outside criticism during his service as attorney general. A recent New York Times article pointed out how Pruitt sent a letter, which was actually written by someone who worked at Devon Energy, under his own name to the Environmental Protection Agency. This act of plagiarism and Pruitt’s cozy relationship with the oil and gas industry was actually condoned by the editorial board of The Oklahoman, the state’s largest newspaper. Oklahoma taxpayers are footing the bill for Pruitt’s ideological gluttony. The Colorado lawsuit is just another example of the extremist conservative excess pervading the state right now.